Baby room wall decor comes in many shapes and sizes, and because the walls are one of the biggest areas in your baby room, whatever nursery wall decor you choose will have a huge impact on your finished design, so it's important to choose something interesting. If you are decorating your baby nursery with a theme browse our theme stores for the perfect nursery wall art to match. You'll find all the best choices from all over the internet here! Paint Your Nursery Wall Decor! One of the easiest and least expensive ways to completely transform a room is to give it a coat of paint. Choose your nursery wall decor colors, slap it on and voila your baby room is halfway there! Paste and Stick Your Nursery Wall Decor! Another uncomplicated way to add a sudden burst of life to your baby nursery! Paste and stickables come in all sorts of shapes and sizes - you can even make your own! This can be used for the whole room, an accent wall or just the bottom or top wall sections. You can combine it with bead board, a chair rail, paint or a different complementary wallpaper. 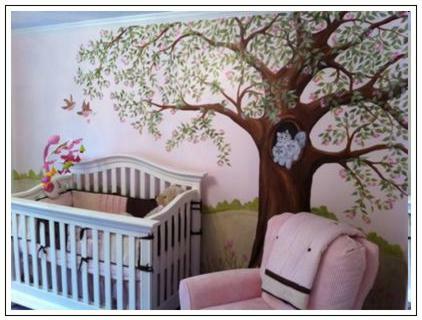 Roommatespeelandstick.com has a gorgeous selection of removable wall stickers for just about any nursery design. 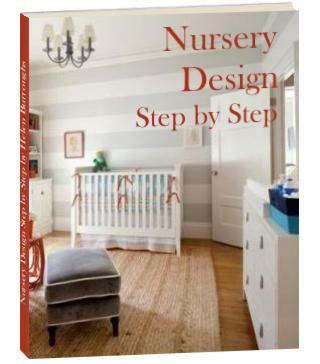 Here are some more ideas for nursery decorating in a rental. You can make effective nursery wall decals for next to nothing! It's easy and so much fun and they're surprisingly durable! In Your Nursery Wall Decor! This is usually used on the lower half of the wall. However, it can also be used to create an effective backdrop to the crib and I have also seen it used on the full wall horizontally rather than vertically to produce a wonderful beach house effect. Hang Your Nursery Wall Decor! After all that painting, sticking and boarding you may find that you still have open spaces on your nursery walls that just need "a little something". Frames come in all sorts of shapes and sizes and can be made from wood, metal, plastic or even ceramics. 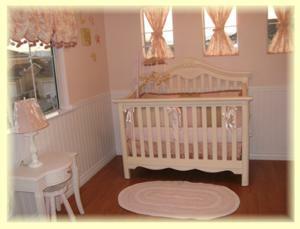 They can hold many different nursery art options - prints, original paintings, special keepsakes, poems and more. Shadow boxes with 3 dimensional creations inside are another creative alternative - and they're easy to do yourself. Similar to above but these have no frame and are typically used in a line or a block to give maximum effect. 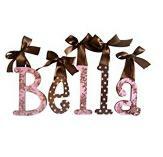 Nursery wall letters are very popular and come in many forms. You can buy them or make your own. They can be a small feature or major focal point depending on their size and position in the nursery. Decorating a baby nursery with alphabet cards is a frugal and highly effective nursery wall art alternative with many different applications. With the right frames, a few special photographs can be very effective. You can create a photo wall, use them as a border around the room or on one wall or just scatter them across the walls like framed wall art. You can even create a family tree or turn them into silhouettes. Growth charts make the perfect keepsake to tuck away and keep forever and they come in many different shapes and sizes. A nursery clock is an essential piece of equipment in your baby nursery. You'll need it to time your baby's feeds and naps and to help keep your sanity when it feels as though you've been up for hours in the middle of the night! 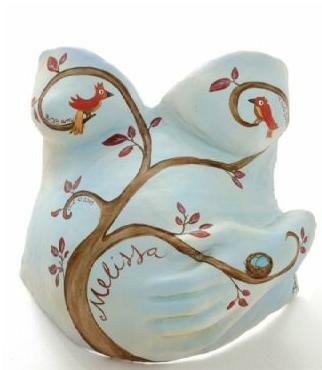 Another wonderful keepsake - there are lots of ways to use your little one's hand and footprints as nursery wall decor. This form of nursery wall art is becoming increasingly popular. Decorate the cast in your baby room colors and put it up for display. An inexpensive and charming decorating option - see if you can find some old vintage baby clothing to use. Mirrors are especially effective in small baby nurseries. They reflect the light and lend the illusion of space to the room. They are available in all sorts of gorgeous frames. Just choose one to match your furniture or your decor. As an added bonus, babies just love to look at their reflections! Shelves make great baby nursery wall decor. Decorate them, hang things from them, prop your favorite baby things up on them - they add a cozy, homely feel. 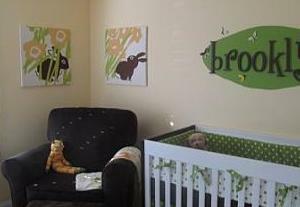 Wall hangings are a versatile nursery wall decor option. Gone are the days when appliqued fabric was your only option. Today you can find wall hangings made from painted wood, tapestry and ceramics to name but a few. My personal favorite - nothing can replace the memories of those first few weeks with your new baba. 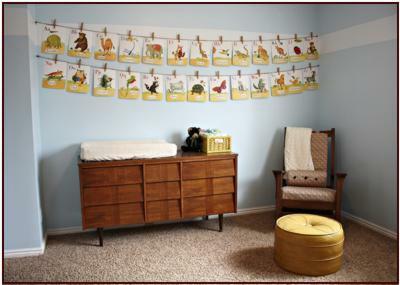 Putting your memories up on the nursery wall is a great way to keep them fresh. A memory collage makes a stunning addition to your nursery wall decor, and it's easy and inexpensive to make! This page is a work in progress - Please check back often for added pages or subscribe to my baby nursery blog to be instantly notified of all site updates.